Big cities lean Liberal and the West leans Conservative — but what patterns can we discern from the partisan lean of ridings throughout the country? Do you live in a riding that leans more toward one party than the others? In theory, every party's seat count is reset to zero when Parliament is dissolved and a new election is called. In practice, there are regions of the country where one party has an intrinsic advantage over its rivals. Some ridings are just more Liberal, or Conservative, or New Democratic than others — regardless of which candidates are running for office. In the run-up to the midterm elections in the United States this fall, you might often hear districts described as having a 'partisan lean'. It's a measure of how much a constituency tilts toward the Democrats or Republicans as compared to the rest of the country. By subtracting each party's national vote share from its performance in each individual riding, it's possible to measure the partisan lean of any given seat. For example, if the Liberals obtained 45 per cent of the vote in a riding when the party had 40 per cent support nationwide in the same election, we could say that particular riding has a Liberal partisan lean of five points — that it's five points more Liberal than the country as a whole. Averaging out these leans over the last three elections lessens the effect of factors that can be unique to a particular election — the ebb and flow of a particular campaign, or the candidates on a ballot. It comes as no surprise where each party's strongholds are located, of course. But a riding's lean is often quite consistent from one election to the next, regardless of what is happening nationwide. Calculating a riding's partisan lean makes it possible to compare one riding to another and put it in a national context, and to identify patterns about where the future of a party lies. The strongest ridings for the Liberals are concentrated in just three parts of the country: Atlantic Canada, Montreal and the Greater Toronto Area. 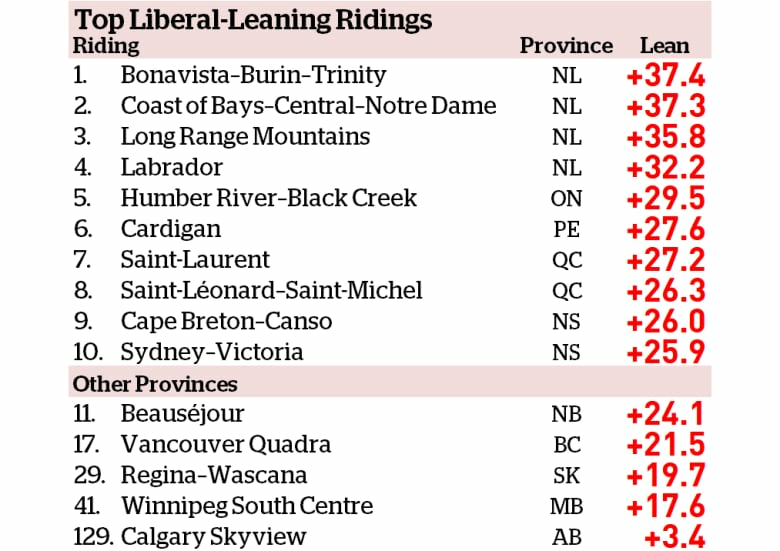 Newfoundland and Labrador is home to the four ridings with the most significant Liberal lean, with the province's four ridings west of the Avalon Peninsula all leaning at least 30 points more Liberal than the nation. Only three of the 50 ridings with the steepest Liberal leans are located west of the GTA; all but seven are located in Atlantic Canada, Montreal or around Toronto. Of the 26 ridings leaning furthest away from the Liberals, 25 of them are in Western Canada — and nearly all of those are in either Alberta or Saskatchewan. The outlier is the Quebec riding of Lac-Saint-Jean. This actually illustrates the potential for local candidates to influence these partisan leans. Over the last three general elections, Lac-Saint-Jean has been 18.1 points less Liberal than the country as a whole. But with the retirement of Conservative MP Denis Lebel and the Liberal candidacy of a popular local mayor, Richard Hébert, the Liberals were able to win this riding in a byelection last year. No surprise here: the ridings that lean most heavily toward the Conservatives are located in Alberta and Saskatchewan. The party's best 18 ridings are in these two provinces. 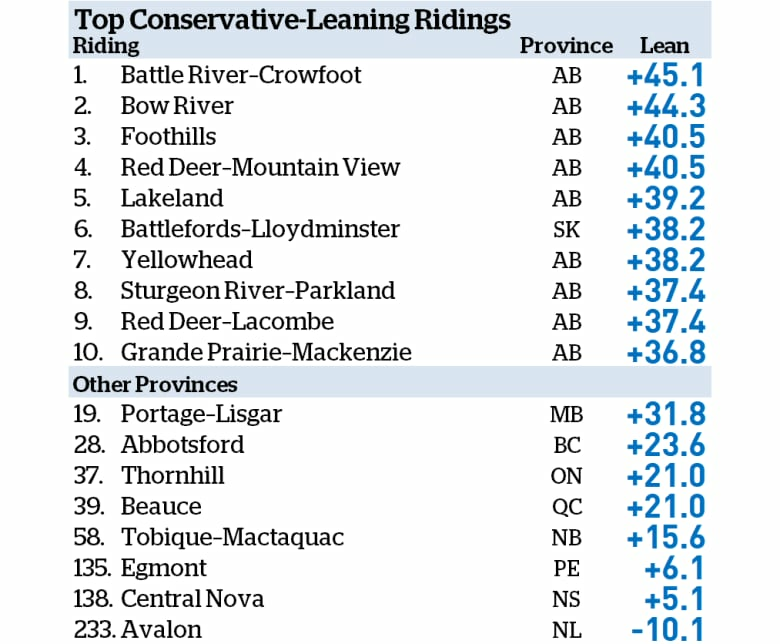 Half of the top 50 Conservative-leaning ridings are in Alberta, with another 17 in British Columbia, Saskatchewan or Manitoba. But the Conservatives also boast more strongholds than either the Liberals or the NDP. In total, 45 ridings have a Conservative partisan lean of 20 points or more. 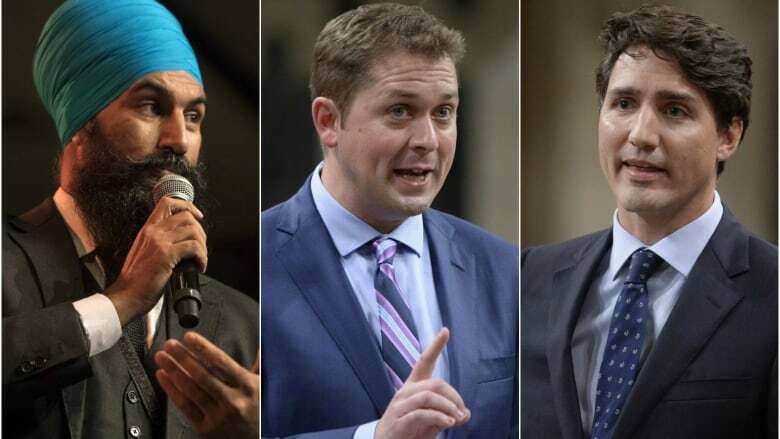 This virtually guarantees the party a win in each of these seats, as it implies that even if the Conservatives fall to 30 per cent support nationwide — a historical floor — they should still win a majority of the vote in at least 45 ridings. By comparison, the Liberals have only 27 ridings with a partisan lean of at least 20 points, while the NDP has just 24. The 22 ridings that lean furthest away from the Conservatives are all located in Quebec, as are 43 of the party's 50 worst ridings. However, analyzing the partisan lean of ridings in the context of a province rather than nationwide shows how there are a few Conservative standouts in Quebec. There are 10 ridings in that province that lean at least 15 points more Conservative than Quebec as a whole. Topping that list is Maxime Bernier's riding of Beauce, which leans 39.1 points more Conservative than all of Quebec. That's the biggest provincial partisan lean any party enjoys in the country. While the Liberal and Conservative leans are geographically distinct, that's not the case for the NDP. Its top 50 ridings are distributed across the country far more broadly. This pattern suggests the NDP's lean can be attributed to the people representing the party in those ridings, rather than to the region. The strongest NDP leans tend to be found in places where they have had some of their highest-profile MPs. At the top of the NDP's lean list is St. John's East, which (until his defeat in the 2015 federal election) was represented by Jack Harris, a former leader of the Newfoundland and Labrador NDP. Also on the NDP's list are a number of ridings which had popular MPs who were not on the ballot in 2015: Vancouver East (Libby Davies), Acadie–Bathurst (Yvon Godin) and Toronto–Danforth, held by Jack Layton until his death in 2011. But while the absence of these candidates put a dent in the ridings' partisan lean, the lean was still there. Vancouver East had a 28-point NDP lean in 2008 and a 30-point lean in 2011 with Davies, but it still leaned 24 points to the New Democrats when Jenny Kwan successfully took her seat there in 2015. Acadie–Bathurst swung to the Liberals, but the riding still had a 21-point NDP lean without Yvon Godin on the ballot. And Toronto–Danforth went from a 27-point NDP lean in 2008 under Layton to a 24-point NDP lean under Craig Scott in 2015 (not enough to keep Scott from being defeated, however). Four of the 10 best ridings for the Greens are on Vancouver Island, suggesting this is fertile ground for the party to make gains in the 2019 federal election. But also relatively high on the Greens' lean list are ridings where provincial Green parties have scored some successes in the rest of the country. Guelph in Ontario ranks sixth with an 8.2-point Green lean, Fredericton is 19th on the list with a Green lean of 4.1 points, and Malpeque on Prince Edward Island is 37th, with a lean of two points toward the Greens. These three areas all elected Green party leaders in their provinces' most recent elections. But there's a complication here. The two best ridings for the Bloc (and three of the top five) are occupied by MPs from Québec Debout, an offshoot of the Bloc Québécois formed by dissident members of its caucus. That split is likely to tilt the balance elsewhere.